Department store group John Lewis has started its own travel brokerage and range of insurance products. Available both online and over the phone, the new services have been launched under the brand name Greenbee. John Lewis said the move, marketed through a new magazine called Source, was a response to calls from customers. The firm, which also owns Waitrose, is the UK's largest example of worker co-ownership, with all 64,000 permanent staff being partners in the company. 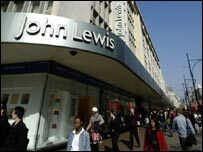 John Lewis' move follows the expansion of other major retail chains into financial products. "Greenbee is bringing the same essential values of trust, simplicity and service of the John Lewis and Waitrose shopping experience to new areas of our customers' lives," said John Lewis chairman, Sir Stuart Hampson. Greenbee has teamed up with partner companies such as Axa, Expedia and See Tickets for its initial range of products. Additional life assurance and travel services are expected to follow next year.